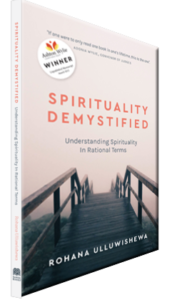 I didn’t expect to find myself humming the old hymn Immortal, Invisible, God Only Wise at the launch of Spirituality Demystified: Understanding Spirituality in Rational Terms. But, as I listened to Rohana Ulluwishewa talk about our inner and outer realities as conscious energy, the words and music embedded in me seemed to reach up from the past for connection into the future. What if, I wondered, Michelangelo had painted interconnected energy on the ceiling of the Sistine Chapel instead of a male God. Would cathedrals now be hosting rituals to help us stand in awe and wonder at the privilege of living within our intelligent and elegant cosmos? But I guess we’re all prisoners of what we know within the contexts that form and shape us. We need courage, imagination and rigorous thinking to get past our limitations. Like the Sistine Chapel, Spirituality Demystified is both an enchanting and academically interesting experience. Rohana thrusts readers into a whistle-stop tour of quantum physics, neuroscience, psychology and consciousness. It’s a deceptively simple read but only because of his ability to translate complicated scientific information into easily digestible chunks. Winner of the Ashton Wylie Unpublished Manuscript Award for 2015, Rohana has held many academic posts including Associate Professor at the Sri Jayewardenepura University in Sri Lanka. However, towards the end of his career, he realised that external developmental changes could not solve poverty, inequality, unsustainability and unhappiness because they were the result of our spiritual underdevelopment, manifested as self-centeredness, fear and greed. Like many others before him, Jesus and the Buddha included, Rohana believes the world urgently needs a spiritual transformation, but that no external force can manage this. He says, ‘the only way to transform the world is to transform ourselves’. It’s as though he’s calling us on a spiritual pilgrimage, a life of faith, not based on beliefs but on clear, scientific understanding. Definitions matter when building an argument. Spirituality Demystified defines spirit as that which gives vitality to a system and spirituality as ‘the state of being one with spirit, our inner reality, the conscious energy which fills the whole universe. In spite of its vastness, it functions as a single unbroken one’. On these foundations, Rohana builds his thesis, beginning with a journey that goes deeper and deeper into the human body until we are faced with only atoms and forced to see that those atoms are 99% empty. This reminded me of the biblical story of the crucifixion. At the moment when Jesus dies the curtain covering the holies of holies in the Jerusalem temple is torn in two. Nothing is behind that curtain. We are faced with the holy no-thing. The ancients intuitively knew a thing or two. They understood that to worship things inevitably leads to narrowing and dumbing down, eventually landing at fundamentalism. The need and greed to own and control the holy things becomes overwhelming. Whereas stillness and space has a way of opening us to a reality beyond things, even as we struggle to comprehend it. Quantum physicists have brought diverse worlds together with their understanding that the emptiness of the atom, and perhaps the emptiness of the holy of holies, is filled with energy, invisible energy, a prime energy which is aware, conscious and thinks. More and more it seems as though harnessing that energy for good is in our hands, or more precisely our brains. Rohana plunges into neuroscience to explore the idea that oneness, love and selflessness are hardwired into our brains, although these qualities are often overridden by pleasure seeking. Chapter 3 is illuminating on addiction to pleasure and the challenge to liberate ourselves from it, which has always been the tough but transformative call of a spiritual path. In New Zealand, where people are choosing let go of ties to particular religious traditions or never taken them up in the first place, Rohana offers us a helping hand to understand and language the spiritual call in ways that make sense to a scientifically focused modern mind. Even more, he draws us back to the contemplation essential for this awakening to reality. Whether we use the path of devotion, action or wisdom to get to reality our ability to offer unconditional love, the force that keeps us together in harmony, will be enhanced. As Rohana says, ‘..if we transform ourselves, the small world around us will begin to follow’. Prev Hospital Chaplains too Christian for Nones?